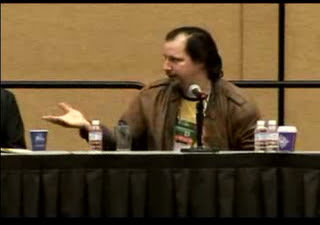 A one hour video of the IGS panel has been posted at GameSetWatch. Participants include Derek Yu (Aquaria/Bit-Blot/TIGSource), Greg Costikyan (Manifesto Games), Mark Morris (Introversion), and Eric Zimmerman (Gamelab). I found the conversation pretty interesting, especially the analogy at the beginning that Greg started and Derek moved into hilarity.